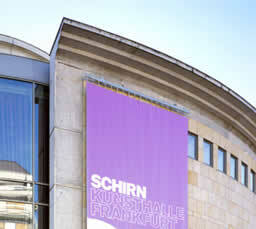 The SCHIRN KUNSTHALLE FRANKFURT is one of Europe’s most renowned exhibition institutions. Since 1986, more than 170 exhibitions have been realized, among them major surveys dedicated to Vienna Art Nouveau, Expressionism, Dada and Surrealism, the history of photography, topical positions in sound art, to subjects like shopping and the relationship between art and consumerism, the visual art of the Stalin era, the Nazarenes, or the new Romanticism in present-day art. Artists such as Wassily Kandinsky, Marc Chagall, Alberto Giacometti, Frida Kahlo, Bill Viola, Arnold Schönberg, Henri Matisse, Julian Schnabel, James Lee Byars, Yves Klein, and Carsten Nicolai were presented in comprehensive solo shows. The SCHIRN, with Max Hollein as director, presents explosive issues and topical aspects of artistic oeuvres in a concise language under contemporary aspects. Being a venue of discoveries, the SCHIRN offers both sides to its visitors: an original sensuous experience and committed involvement in cultural discussion.